Partners in Time Description 1: Press and release the button to kick falling eggs into the enemy! 2: Toss them higher with the baby buttons, then kick them for more power! Smash Eggs are Bros. Items found mostly in Yoshi's Island in the game Mario & Luigi: Partners in Time. Smash Eggs have orange and yellow star-shaped spots. Mario, Luigi, and the babies can kick these eggs to the enemy. Once the first kick has set the Egg in motion, the Mario Bros. must prime themselves for when the Egg comes back down. The player must hold either A or B and release it at the correct time to kick the egg back at the enemy. Failing to do so will result in the Mario brother tripping and losing the Egg. Additionally, the babies can jump and hit the Egg to make it fall faster and cause more damage with the next hit; however, doing so will cause the timing to change. 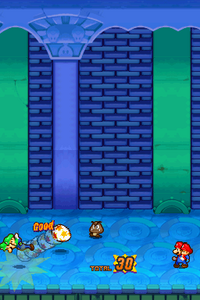 The egg-kicking can be done repeatedly until the Smash Egg breaks up. Occasionally, an item comes out of a Smash Egg. German Pardauz-Ei Roughly "Oopsy-Daisy Egg", "Bam Egg"
The Smash Egg physically resembles the Star Egg from Super Mario RPG: Legend of the Seven Stars. In the sequel, Mighty Meteor, a Bros. Attack, has very similar effects to the Smash Egg. This page was last edited on November 20, 2017, at 20:06.